I cleaned up the water bug today , sprayed her down with a vinegar bath and taped up her important parts. Let it all air dry in our 30 mph wind. The wife made me tarp off the big boat , she was afraid the over spry may make her shiny Hewescraft my get a camo paint job too. ?? 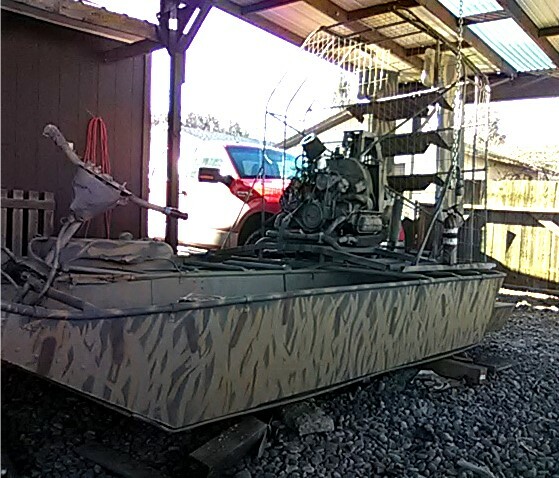 The primer I got is " Parkers" aluminum boat primer, as well as the flat camo paint, just an old school enamel paint. Should be easy to put on, we will see. The primer is light gray, I also got Bay gray, dead grass, sand tan , and cat tail brown, all quarts ,sept the cattail it is one spray can. In the morn the wind will be light and the temp needs to be above 40*, should be. I'll prime EVERY thing Motor, wood parts, steel parts and the Aluminum hull inside and out. The bottom has "slick" paint on it now , that will stay the same. Dang I sure had to thin it to spray. One quart was not enough to prime it all in side and out. I got all the aluminum stuff primed and a lot of the wood, floor/ sides. I had some rust oleum all metal primer in similar gray so I did the iron and rest of the wood in that. Next step I'll do all the out side in flat "Bay Gray", like a dark battle ship gray. I'll have to do the in side with the "Sand" color . I have dead grass color and the sand, and a spray can of "Cattail" brown for the "Heads"
I was going to do a pebble look in side but the paint ran out . Maybe with a rattle can. That sounds like a real good paint job, D! I used to spray paint for a living for several companies and it sounds like you are doing a great job. When I painted for GE we had the best of equipment. I timed my paint 18-21 in 5 gallon pots. What we used was auto paint for indoor and outdoor switchgear. It was painting steel, no aluminum. The finished switchgear had to be as good as a finished automobile. I sure would like to see the Waterbug. You have sure put your heart into the build and I really like it. Finished with paint for now. Lookin' real good D. You gonna black out the cage ? That looks great, D! What next? 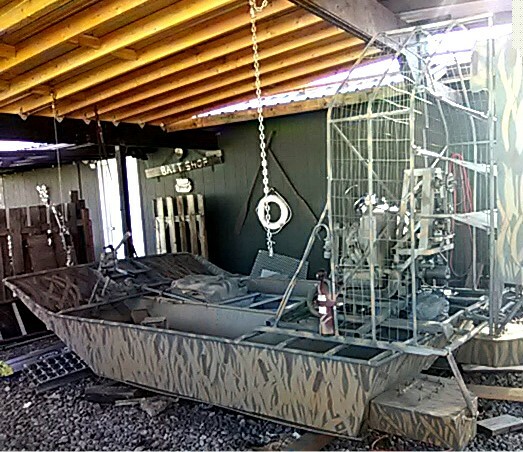 The cage is painted the same as the boat as is the motor and prop. Nice! You getting it into the water today?